"It''s anything but"... just a journal. It''s the Regular Show Mordecai and Rigby Journal from Bif Bang Pow!! Take your favorite blue jay and raccoon with you. What bizarre and surreal misadventures will they (and you) land in next? Record them all in this hardbound journal''s 320 lined white pages! Themed to Cartoon Network''s TV series Regular Show. "It''s anything but"... just a journal. Indeed, it''s the Regular Show Mordecai and Rigby Journal from Bif Bang Pow!. 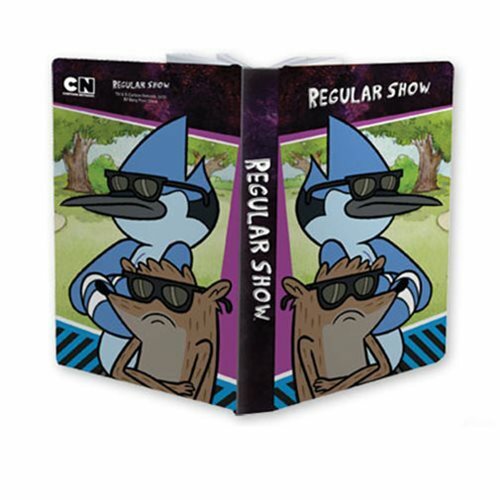 Featuring those zany characters Mordecai and Rigby on the cover, the show''s logo on the spine, and the entire gang on the back, this 8-inch tall x 5-inch wide hardbound journal contains 320 lined white pages, all yearning for your pen. Want to avoid work and create misadventures to enjoy life and overcome boredom? Now there''s a place to write them down! What bizarre and surreal adventures will this blue jay and raccoon (and you) land in next? Ages 14 and up.